Driving shotgun with a Mexican artist through the streets of Tijuana. My friend Marcos Ramirez (aka “ERRE”) isn’t kidding. He’s building a new house in Colonia Libertad, Tijuana’s oldest and most surrealistically colorful neighborhood, and needs to dispose of some construction debris. I ride shotgun in his pickup while his younger brother Omar, a poet-artist with eyes like Che Guevara’s, sprawls in the backseat. For once in a lifetime, afternoon traffic in Tijuana is unsnarled and ERRE spurs his Chevy Silverado through the Zona Rio roundabouts, past the giant statue of Father Kino and the utopian sphere of the Cultural Center, until we reach the Avenida Internacional, the long straightaway next to the corrugated steel futility of the border wall. As the road climbs the mesa, there is a jarring view of landscape disfigured by National Guard bulldozers and the endless churning of terrain by Border Patrol jeeps. But today even the brutalism of Operation Gatekeeper is ameliorated by blue skies and a tickle of a sea breeze. ERRE catches the mood and puts on a Beach Boys CD. I have a sudden inkling of what he must have been like when he was a 15-year-old outlaw skateboarder from Colonia Libertad, careening suicidally down its rutted slopes. Later, he briefly practiced law, but quickly turned away from its corruption to work for 17 years as a skilled carpenter and homebuilder in the United States. In 1997, he confounded the Border Patrol by erecting a huge Trojan Horse (two heads, facing in opposite directions) at the San Ysidro frontier. It exactly straddled the international line. Tijuaneses loved it. The old city dump is closed, the new one too far away, so like most Tijuaneses, ERRE uses the services of the informal economy. Moreover, in the midst of an unprecedented NAFTA recession, a horror-ridden narco-war, and now a much-hyped pandemic, any act that circulates a few pesos amongst “el pueblo” seems conscientious. We fishtail out of the dirt alley and return to a paved avenue of restaurants, beauty salons, and car-alarm dealers. Schools and public buildings are closed, morning masses have been suspended, and sports events have been cancelled, but stores and street markets remain open and desperate for business. Customers are sparse, though. Half the population seems to have disappeared. Few people, apart from municipal employees and office cleaners, wear surgical masks, but no one seems to begrudge those that do. “Looks like the Invasion of the Body Snatchers,” I say. “Then the famous archeologist Felipe Solis suddenly died. He was the director of the National Anthropology Museum and the previous week had given Obama a tour of Aztec treasures. There were rumors that he had swine flu. [This was subsequently denied by medical authorities.] That chilled the whole scene. People didn’t know what to expect. It was like the Camus novel [The Plague]. Best friends were afraid to give each other an abrazo or a kiss on the cheek. We turn eastward, crossing the legendary Avenida Revolución, past the curio stores, discos, and long bars—remnants of the raunchy Tijuana invented by gringo bootleggers and gamblers during the early decades of the twentieth century. There are no tourists. Nada. Although the only confirmed swine flu cases locally are across the border in San Diego, Tijuana as usual bears the stigma—the growing fear of all things Mexican even when they originate, like the demand for drugs or the industrialized livestock from which this new flu probably sprung, in the United States. “Feel lonely, gringo?” ERRE laughs. To console me, he points out that there are no cops on the streets either. Three days earlier, drug-cartel gunmen launched simultaneous attacks on police across the city, killing seven in half an hour, one of them in the small station just up the block from the Ramirez family home. Using decoders to break into the police radio frequency, the killers daily taunt the cops, blasting loud narcocorridos and boasting of future assassinations. “Why are they so pissed off at the cops?” I ask. “I think the police confiscated a huge drug cache,” younger brother Omar interjects. We stop at a light. Some desperate squeegee guys without water bottles scuffle over ERRE’s windshield. Two soldiers on the corner of Paseo de los Heroes observe the melee with indifference. Masked by black bandanas, they cradle new made-in-Mexico FX-05 assault rifles in their arms. It is disturbing that the presence of troops should be so reassuring. The Mexican Army has an appalling human-rights record, and some leftists believe that the pandemic emergency has become a mere pretext for the further militarization of daily life—like shutting down this year’s May Day demonstrations. ERRE shrugs. It is difficult, he explains, to imagine how control of public safety in border cities like Tijuana or Ciudad Juarez can ever be returned to the corrupt, and now terrified, cops. The elites, meanwhile, ensure their own safety by hiring Blackwater-type mercenaries. ERRE yawns. Heavy metal on the streets of Tijuana is no big deal. By the time we reach Colonia Libertad, it’s 4 pm and some bustle is returning to the streets. We park in front of the old family home, across from some chemical tank cars marooned on a branch of the San Diego and Arizona Eastern Railroad. The family guard dog, a middle-aged Chihuahua named Momo, barks dutifully from the roof. ERRE has to rush to take his dad to a doctor’s appointment. Señor Ramirez hails from a proud cowboy town in Jalisco that claims to be the birthplace of the mariachi. After traveling around as a movie projectionist in the villages of the Alta, he came to Tijuana and Southern California in the early 1950s. He worked as an extra in Hollywood, on an aircraft assembly line in San Diego, as a cab driver in Tijuana, and now, almost age 80, oversees the family wrought-iron workshop. The patriarchal home, like Tijuana itself, has been self-built in increments that faithfully graph the family’s economic history. The 1990s boom years, when ERRE was a well-paid carpenter in California, are represented by an impressive faux-Victorian wing with dormers, bays, and gables. Omar says it is based on one of French sculptor Frederic Bartholdi’s original sketches for the Statue of Liberty— the famous lady with the lamp standing on the pedestal of an Aztec pyramid. A local artisan has made copies to sell to the tourists, if they ever return. Since 9/11, irrational fear and toxic bigotry have imposed an informal blockade on Baja California’s non-maquiladora economy. 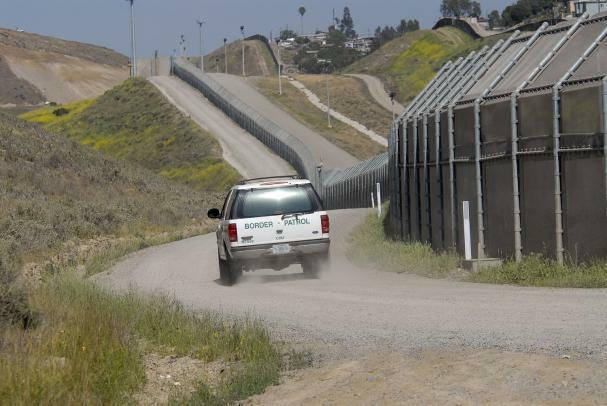 Now nativists in San Diego are clamoring for the complete closure of the border. It would be a catastrophe. A Siamese twin might as well saw away the flesh connecting himself to his brother. Both would die in the end. After teasing ERRE one more time, I head off for dinner with Omar and his wife. The weather is still delightful and we find a cozy Italian restaurant crowded with nonchalant and fearless diners. For a quiet evening, at least, the mask of the red death slips off the face of Tijuana. Mike Davis is the author most recently of In Praise of Barbarians: Essays Against Empire (Haymarket Books, 2008) and Buda’s Wagon: A Brief History of the Car Bomb (Verso, 2007). He is currently working on a book about cities, poverty, and global change.